The holidays are here whether you’re ready for them or not. With the holidays comes cooler weather, holiday songs, and treats of every shape and size. One of the best ways to spread holiday joy is to decorate your home both inside and out with lights, tinsel, and other fun objects. But if you’re having a hard time deciding how you should decorate your home and awning, then the Van Nuys Awning Co.® has the perfect blog for you. In today’s article, we’ll go over the best methods you can use decorate your custom awning. If you’re looking to get a custom awning or canopy for your home, then Van Nuys can make you the perfect one for you. 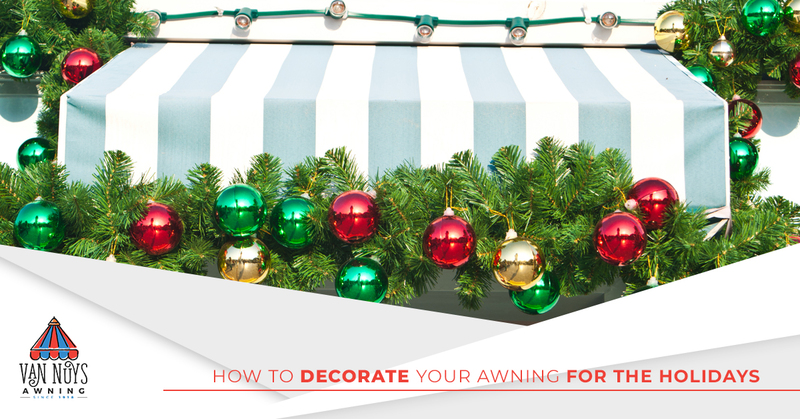 Keep reading to learn how to decorate your awning or canopy for the holidays. One of the best ways to bring holiday cheer to your home is to add lights. Traditionally, people hang lights from their roof, around the outside of their house, and even in their lawn. You can do the same to your awning as well as any outdoor fixtures you want to incorporate with your holiday display. Wrap lights around the legs and banisters of your awning, having them go all the way up to the top of you awning. You can hang or wrap lights from the arms and rails of your awning, making sure to cover each part adequately. All kinds of lights will look great on your awning, whether they’re multi-colored, plain-white, or any one singular color. The fun doesn’t have to stop at your awning though, you can put lights all around your backyard. Make a theme and stick to it while you plan out the scheme for your backyard light display. You can get all kinds of lights from your local hardware store, home improvement store, or supercenter. Our you can create your own from rope lights and a little imagination. Just be sure to follow the rules set in place by your local HOA, or you may have a rough holiday before it even begins. Nothing says the holidays quite like some well placed garland. Not only does this accent natural features, such as wood or wood composite, but it will go great with just about any material your custom canopy is made from. Buy fresh garland to get aesthetics as well as that fresh pine smell, or go with the fake garland so you can use your natural decorations year after year. Wrap the garland up the legs, or around the rails and arms of your custom awning. You can also add other features like lights, ribbon, beads, and fake snow for an even better display. Keep the decorating party going by adding the same features to the outside of you house or deck area. Just don’t go too overboard with the garland, a little bit can definitely go a long way at times. We here at the Van Nuys Awning Co. hope you’ve found this blog to be helpful. Learn more about Van Nuys, view our gallery of awnings and canopies, or contact Van Nuys Awning Co. today to answer any questions.